Last weekend, Mach1 Motorsport travelled to the first race of the CIK-FIA KZ2 European Kart Championship at the Prokart Raceland Wackersdorf with their drivers John Norris and Toni Greif. Under best kart racing weather conditions, both drivers gained a ticket to the finals, thereby underlining the German Mach1 kart’s potential. 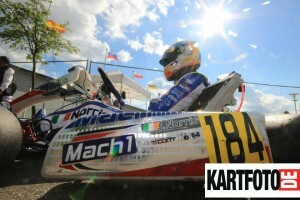 John Norris broke new ground: It was only the second shifterkart race of the Irish’s career and he performed remarkably. During free trainings, the current leader of the German Kart Championship was already among the top ten and could thereby propitiate team leader Martin Hetschel before qualifying: “Up until now, I’m more than content. John is doing remarkably among this top-class field.” During qualifying, the shifterkart rookie aimed a little too high though and couldn’t get past 43rd position. The following six Heats went equally mixed. In addition to great sixth and eighth places, he also had to deal with a questionable three-second-penalty for noise exceedance and a disqualification. Due to these circumstances, on Saturday evening he was only on 53rd position among the field consisting of 98 drivers. Team mate Toni Greif proved all of his shifterkart experiences during the weekend and was on a level playing field with his competition right from the beginning. But qualifying went a little mixed for him as well: Toni couldn’t be content with 53rd position. He then gained some ground during the Heats and came in on 44th place on the overall list of rankings. He then improved his performance even more during the pre-final: Having started from 22nd position, he came in on the great 14th place, thereby also entering the finals. From 28th starting position, he was able to come as far as 22nd position, but then became the victim of a collision during the course of the race and lost numerous places. With a huge gap between him and the main field, he wasn’t able to get past 27th position in the end. Racing action is waiting for the German Chassis manufacturer next weekend already: the second ranked race of the ADAC Kart Masters will be taking place in Oschersleben.